Definition: The Straddle Positioning is one of the positioning strategy adopted by the marketers to position their product in two categories simultaneously. In other words, the positioning strategy adopted to create a dual image of the product in the minds of the customer is called as Straddle positioning. 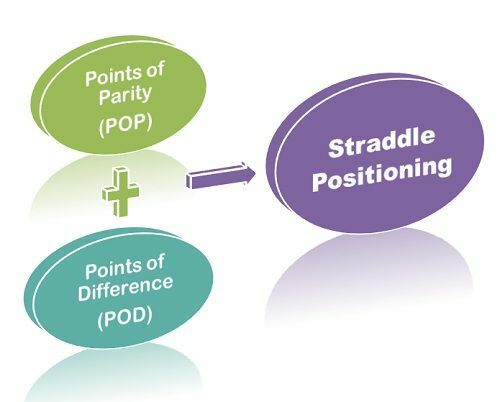 In straddle positioning, the marketers use the blend of POP (points of parity) and POD (points of difference) to arrive at the categories for which they are positioning their products. When BMW entered the market, gave a stiff competition to other luxurious cars because at that time, all the luxury cars focused on its luxury and overlooked the performance factor. BMW came with the dual positioning as luxurious (POP) as well as performance (POD) and substantiated this by its slogan “the ultimate driving machine”. In the case of Scorpio, it came with the dual positioning as luxury as well as the adventure that helped the marketers to gain dual benefit in case of a luxury segment as well as in the adventure segment. In the case of the luxury segment, the luxury is POP and the adventure is POD and for the adventure segment, luxury is POD and the adventure is POP. The dual positioning of Dominos, product attributes as well as desirable benefits. The product attributes (POP) means providing the fresh pizza and the desirable benefit (POD) are the home delivery that it offers. Positioning the product in a single category is more convenient for the marketers since its success depends on a single factor, but in the case of straddle positioning, the marketers have to ensure that the categories for which the positioning is done are successfully met by the product. It can be a great hit if applied correctly else it may result in the huge losses if the product fails to meet its promises.